I like to compose electronic music on my spare time and this page includes results of those sessions. I have been making music since 1996-1997 when I got in touch with computer music in a form of Fast Tracker songs. 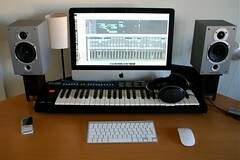 Time has passed by and the methods of creating the music have been changed but I still make music just for fun. I don’t have any commercial need with my music and that’s why I don’t have to try to make my music sound something specific or categorized into some strict genre. I like to try different styles and moods. My music is usually quite melodic and ‘chillish’ because I like music that you can play when you wan to chill out. It’s really difficult to categorize my music because my songs usually have influences of house, trance, ambient and chillout music – electronic in general. I was a member of a house music project called the modern // inhazers with another musician “spoiler” (aka. Andy State / Antti Haikola) and some of the songs by m//i were made by me. The m//i project has ended and we will propably never release anything under that name. Our old mp3 files are not available in the internet anymore so if you want to get some of them, please contact me. I was also a member of a finnish demo music group Dct2 in the late 90’s. I made tracker songs for that group and some day i might put a zip package of those modules available here. I have always used a lot of soft synths and software samplers to create my music but since 2013 i’ve been learning to play the bass guitar to get some organic bass sound to my tracks. Sound quality has always been an important thing for me. I’m using different speakers and headphones while making the final mix of my songs so that my songs would sound good on any decent systems. My main headphones while composing are the Sennheiser HD-650 and the secondary ones are Grado SR 80. I like the open sound stage of the Sennheisers and the pure and clean nature of sound on the Grados. As most of the commercial music released today are made as loud as possible (see Loudness war)Â i’m trying to avoid that by not over compressing my music. You can read more about the loudness war here.